Originally constructed as a holiday home for a wealthy industrialist in 1879, Lindeth Howe was later bought by a retired army captain who would rent out the property to guests - amongst these were the family of Beatrix Potter. Indeed, this is a very important place when it comes to the life of the celebrated children’s author. First, it is said that while staying here in the early 1900’s that she illustrated two of her most famous stories: Pigland Bland and Timmy Tiptoes. Secondly, following the death of her father, Beatrix purchased the property for her mother, Helen, to live in. 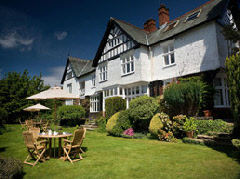 Today, Lindeth Howe is a respected small hotel offering 34 guest rooms and whose restaurant boasts 2 AA Rosettes. Extended in the latter half of the 20th century, the place is somewhat larger than Beatrix Potter would have known it, and it now features an indoor swimming pool and fitness centre. Four star rated, the property is set amid beautiful gardens and is just a few minutes away from the shores of Lake Windermere on foot. Kendal and Ambleside are within easy reach by car.